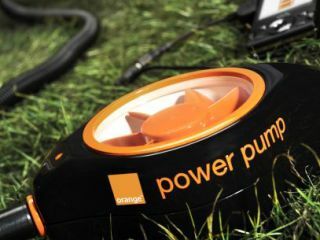 Orange has unveiled its 'power pump' for music festival Glastonbury, with the prototype camping foot pump able to charge your mobile. The pump is designed to keep your phone topped up while out and about and not near a power point. Orange's prototype will be available to people at Glastonbury who want to top up their mobiles. It's obviously likely to prove popular with festival goers - although there are normally special charge points provided - often powered by wind turbines. This is, obviously, a far greener way of keeping yourself connected than plain old National Grid electricity, but being Glastonbury it would probably be more popular if it could power a nice hot shower.